I would like to take this opportunity to express to you my deepest gratitude and appreciation for all that you and your staff have done for me. 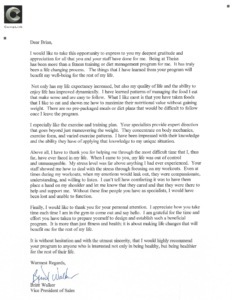 Being at TheissCare has been more than a fitness training or diet management program for me. It has truly been a life changing process. 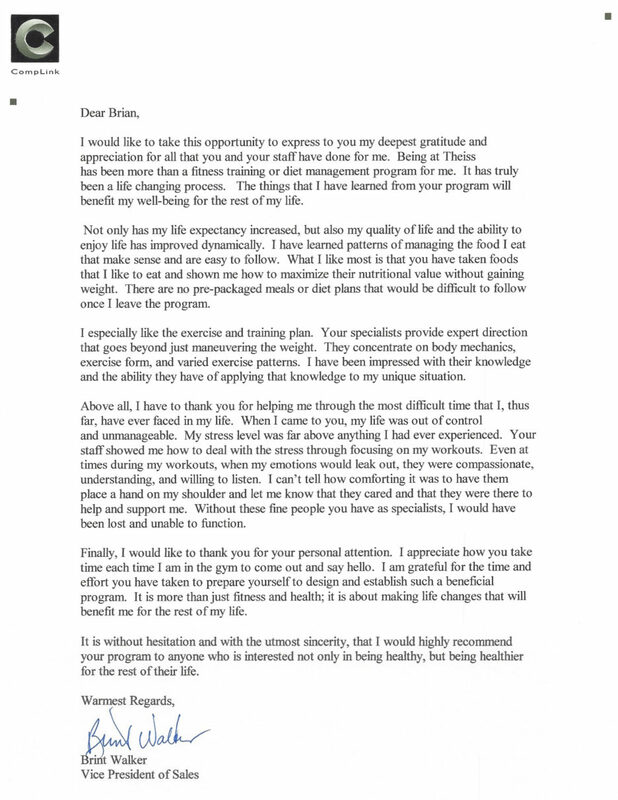 The things that I have learned from your program will benefit my well-being for the rest of my life. Not only has my life expectancy increased, but also my quality of life and the ability to enjoy life has improved dynamically. I have learned patterns of managing the food I eat that make sense and are easy to follow. What I like most is that you have taken foods that I like to eat and shown me how to maximize their nutritional value without gaining weight. There are no pre-packaged meals or diet plans that would be difficult to follow once I leave the program. I especially like the exercise and training plan. Your specialists provide expert direction that goes beyond just maneuvering the weight. They concentrate on body mechanics, exercise form, and varied exercise patterns. I have been impressed with their knowledge and the ability they have of applying that knowledge to my unique situation. Above all, I have to thank you for helping me through the most difficult time that I, thus far, have ever faced in my life. When I came to you, my life was out of control and unmanageable. My stress level was far above anything I had ever experienced. Your staff showed me how to deal with the stress through focusing on my workouts. Even at times during my workouts, when my emotions would leak out, they were compassionate, understanding, and willing to listen. I can’t tell how comforting it was to have them place a hand on my shoulder and let me know that they cared and that they were there to help and support me. Without these fine people you have as specialists, I would have been lost and unable to function. Finally, I would like to thank you for your personal attention. I appreciate how you take time each time I am in the gym to come out and say hello. I am grateful for the time and effort you have taken to prepare yourself to design and establish such a beneficial program. It is more than just fitness and health; it is about making life changes that will benefit me for the rest of my life. It is without hesitation and with the utmost sincerity, that I would highly recommend your program to anyone who is interested not only in being healthy, but being healthier for the rest of their life.